Wetlands, low to mid elevations (6). Locally abundant in perennially wet areas (3). Marshes, muddy shores, shallow water (fresh and brackish) at low to mid elevations (3, 6). Germinates and establishes best in moist bare soil. Wetland obligate and dominant species in wetland environments (2). Seeds mature in late August through September. Because they are easily dispersed by wind, it is important to collect seeds close to time of maturity. Seeds need to be cleaned and separated from the panicle (1). Germination rate increases with cold stratification of 2ºC for 30-75 days. Prewashing with 10% acid solution prior to a 75 day cold stratification has also been tried (1). Plants can be propagated with either seeds or rhizomes (5). Seeds require light for germination. Press in lightly to assure good soil contact, but do not cover the seed. Soil should be kept moist until plants are transplanted. Germination should begin within 7-10 days (1). Fine to medium textured soil (4). Rhizomes (most common), seedlings, or direct seed. Soil must be kept moist. It is suggested to plant only in wetlands. If wetland is seasonally wet, and plants are small at time of installment, monitor soil moisture and water as needed. Moderate growth rate; long lifespan (4). Environmental Services, Washington Department of Transportation. 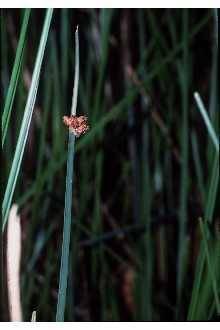 “Scirpus acutus” http://www.wsdot.wa.gov/environment/culres/ethbot/q-s/Scirpus.htm.